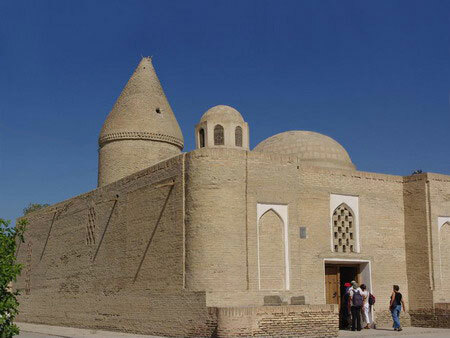 Not far from the famous gate Talipach, in the northwestern part of Bukhara, there is one of the monuments of religious architecture – Mausoleum of Chashma-Ayub. It was named in honor of the Muslim holy Ayub, or Job the prophet from the biblical story. According to legend, before the existence of the city people who lived here were dying of drought, but seeing the itinerant Job, asked him for water. He struck his stick on the ground, and the source of crystal clear water appeared at the same moment. By the way, "Chashma" is translated as "source, well." Mausoleum, in which no graves were found, was built in XII century during the reign of Karakhanids. Two centuries later the construction was continued by caprtives from Khorezm on the order of Amir Timur (Tamerlane), after which it acquired the features of the Khorezm architecture. The conical dome in the form of tent, dark screening coverings, lack of pomp identified the bright individuality of this building. The construction of the mausoleum was finished in the XVI century, and then was rebuilt many times up to the XIX century. And water in the source is still clear and pure. Today in the building of the mausoleum besides the source there is water museum and the exhibition of carpets. But most important thing, which escapes people’s attention: this mausoleum is the evidence of the early spread of Christianity in these lands. And by the way, visiting this monument, do not forget to drink water from the source. They say it has healing properties.